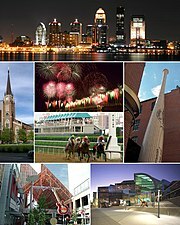 Downtown Louisville is the largest central business district in the Commonwealth of Kentucky and the urban hub of the Louisville, Kentucky Metropolitan Area. Its boundaries are the Ohio River to the north, Hancock Street to the east, York and Jacob Streets to the south, and 9th Street to the west. As of 2015, the population of Downtown Louisville was 4,700, although this does not include directly surrounding areas such as Old Louisville, Butchertown, NuLu,and Phoenix Hill. ^ Wiser, Stephen A. "History of Louisville Architectural Firms". Archived from the original on February 8, 2012. Retrieved April 28, 2010. ^ "Officials Break Ground for Expanded River Park Place – Louisville.gov". September 9, 2013. Archived from the original on September 24, 2013. ^ Nold, Chip; Bahr, Bob (1997). Insiders' Guide to Louisville, Kentucky & Southern Indiana, 2nd. Globe Pequot. p. 278. ISBN 978-1-57380-043-3. Retrieved October 22, 2010. ^ "Village Green CEO: 800 Apartments 'will be the best apartment building in Louisville'". Louisville Business First. June 19, 2015. Retrieved June 3, 2016. ^ "LouisvilleKy.gov - 2006 - Louisville's Downtown Alive with Development". louisvilleky.gov. October 1, 2006. Archived from the original on October 1, 2006. Retrieved December 6, 2011. ^ Davis, Alex (August 19, 2007). "More in store for downtown". The Courier-Journal. ^ "Fischer Announces Plans to Preserve Historic Whiskey Row". LouisvilleKY.gov. May 9, 2011. Retrieved December 6, 2011. ^ "SAR Genealogical Research Library". National Society Sons of the American Revolution. Retrieved October 21, 2015. Yater, George H. (1987). Two Hundred Years at the Falls of the Ohio: A History of Louisville and Jefferson County (2nd ed.). Filson Club, Incorporated. ISBN 0-9601072-3-1. This page was last edited on 26 December 2018, at 00:50 (UTC).